For years, one of the top 10 choices for new kits among armor modelers was a WWI British tank, anything from Mark I to Mark V being nominated. But other than a few resin kits, nothing appeared on the horizon until about 10 years ago when a small British company named Emhar attempted to step into the breach. But their first two kits, while eagerly anticipated, were not very good. Ehmar did not have much of a budget and as a result had to use "flat" molds like many of the kits coming out of eastern Europe. They also made a lot of compromises with the kit, and aficionados of WWI kits estimated they wanted to get all of the tanks out of one set of molds. They did a Mark IV Male, Mark IV Female, and Mark IV "Tadpole" kit before changing over to other subjects. In 2004 they came out with a new kit, a Mark V "Hermaphrodite," that provided all the main parts needed to make either a Mark V Male with twin 6-pdr guns, a Mark V Female with Hotchkiss machine guns, or a Mark V "Hermaphrodite" with one sponson of each type. But all of the tanks – the Mark IVs and the Mark V – used an odd rubbery track that did not look very good, nor did it fit well. As a result, many modelers took one look at the kits and said "toy" before leaving them alone. 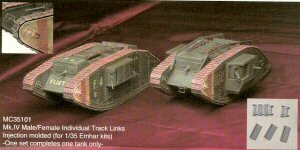 About a year after the first kits came out, Model Cellar, a company from Pennsylvania, came out with a set of injection molded two-piece individual track links specifically for first these kits and later for a "Whippet" kit from Ehmar which used shorter tracks of the same style. Each link consisted of a plate section and a guide section, and had friction fit tabs for temporary assembly and installation. There have been a good deal of comments on the internet about these tracks, so let me cover what they are and what they are not. The tracks used by most Mark I to Mark V tanks were 20 ½ inches in width, or about 14.9 mm wide in 1/35 scale. First off, a number of "experten" modelers have slammed them for being the wrong size. Measuring carefully, each plate section is correct on pitch but measures only 14.25-14.3 mm in width or roughly 19 5/8"-19 7/10" in width. Given the track runs on the tank appear a bit narrow, and the tracks LOOK "right", I for one can forgive them being less than 7/8" of an inch too narrow. There are problems in installing them, however, but none of those are Model Cellar's fault. The kit has only solid plate backing to the track runs over the top of them and the rest are either open with narrow side ledges or where the wheels go. Since the tracks are close to scale they are a tad too narrow to sit on the kit's ledges (note that the kit tracks fit on them, but the kit's tracks are also more than a scale inch too wide.) You are up to your own devices to get the tracks to fit here, and I suggest using strip styrene to extend the ledges to get some purchase for the tracks. One thing on which I disagree with Model Cellar is their direction to leave off the kit's wheels. This leaves the modeler no place to "wrap" the tracks and can spoil fitting them. However, doing some careful measurements and checking the parts, there is a happy solution. Cut one half of the cylindrical hub off each pair of wheels and cement them together. Using a punch or cutting up the section of hub you removed, place an 0.080" (2mm) spacer on each side of the wheel assembly. Drill out a center hole on each side and install the wheels. You may need to narrow the tread width of the wheels to fit in the grooves on the guide sections, but the result is that you can now use the wheels to "wrap" the tracks and get a better fit. The "Whippet" set will also be re-released for $26.00. The former "Tadpole" set, however will not be redone. Right now the track sets are out of production, but Model Cellar has informed me they will be going back into production this spring to meet demand for the Mark V kits. I for one am glad to see it and will probably pick up a couple of more sets – I am working on a Mark V Male from the 304th Tank Battalion (Heavy) and now want to do a Mark V* Female as well! Track sets will only be available direct from Model Cellar: Model Cellar, PO Box 388, Horsham, PA 19044; phone (215) 672-1432 or e-mail them at modelcel@modelcellar.com. Website (listing availability) is http://www.modelcellar.com. Thanks to Paul from The Model Cellar for the update. Thanks to Steve Zaloga for the review sample.